marlene b. creative: ...Hate Me Because I Have Steak. Once I began cooking regularly I understood more the term "Culinary Arts". By no means do I place myself in that category, but seeing the art in cooking not only enhanced my enjoyment of it but also inspired me to experiment. Just as I play with color and texture in clothing, light and composition in photography, I can play with flavor and balance in food. To survive we must eat, to survive in good spirits we should eat well. Food deprivation is torturous, over-indulgence is unhealthy. The key is moderation. Eat anything you want, but not everything you want (more or less). Today I wanted steak. Not just any steak, Daniel's Broiler steak. Instead of flying to Seattle to fulfill the craving I did my best at home. Of the three grocery store options here one happens to sell pretty good beef tenderloin and a selection of fresh produce impressive for this area. 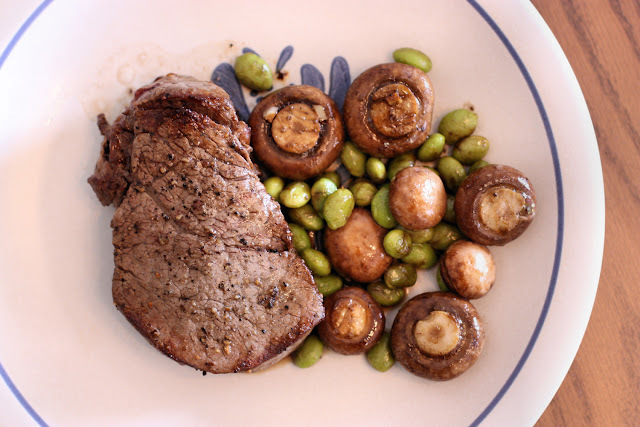 I selected some fresh, brown button mushrooms because they complement beef so well and a bag of frozen, shelled edamame because digestively they balance the steak. For the most part, I believe simple ingredients and simple steps create wholesome, tasty meals. There are always exceptions, this is not one. I seasoned the filet with fresh ground sea salt and black pepper and quickly pan-seered the outside in melted butter. Real butter. Then I threw it on a pre-heated broiler pan in my beloved toaster oven and broiled it on one side for a few minutes, flipped it and did the other side for just a couple minutes. It ended up on the medium side of medium-rare because I was cooking the mushrooms a little different than usual and my timing was off, but it's a thick cut and didn't suffer much. Adding to the browned butter I threw in a clove of roughly chopped garlic, some splashes of Worcestershire sauce and a sprinkling of celery seed. Why celery seed? Why not? I had it, it smelled fresh and mild so as not to overpower other flavors and I thought it would work well with the salt. They make celery salt so they must compliment, right? See, that is where creativity come in to play. While sauteing the mushrooms I microwaved the bag of edamame for less time than recommended because I like it closer to raw then fully cooked. Once done I put a handful in the pan to mix with the sauce for a minute. That's it. I paired it with a run of the mill California Cabernet Sauvignon to balance out the cost of the meat, so it worked with the meal but was not a stand out. In the warm days of Texas we chill our reds because by the time we carry the glass to the table it's at cellar temp. Just a nugget of local info.